SeanOKelly.us » I Took a Real Vacation! I Took a Real Vacation! 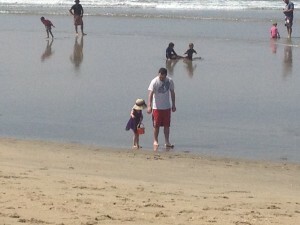 So last Tuesday (May 8) I really felt like I needed to get away, spend some time with God, Amanda, and the kids. So I took a week off work. Wednesday I took Amanda to Tahoe for the day. We spent the day talking, driving, and sitting by the lake. While she sunbathed, I read some more of Road Trip Leadership by George O Wood; love that book. After a great day of just being together, we ate at a hippy health food place and went home. 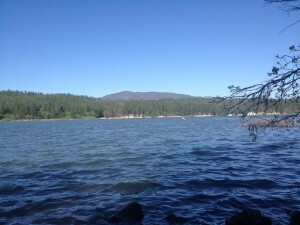 It was just nice to be away, without kids, without a plan or agenda. 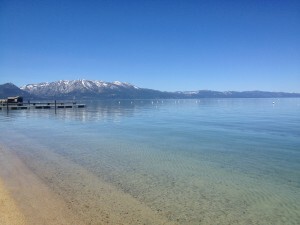 I also used the time driving over to Tahoe to tell her instead of going to Burney Falls for my retreat, I thought I needed to: a. Dip my toes in the Great Salt Lake b. Reforge the Oregon trail by covered wagon c. Mine some gold after traversing the Yukon trail d. Drive to Alaska and then come back home. 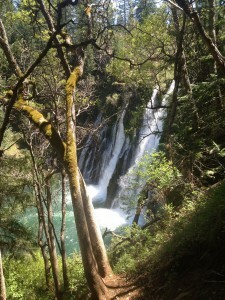 She wasn’t too excited about those options, so the next day I drove up to Burney Falls by myself. Without going into any specific details, I made excellent time. I had a great time just worshiping God as I drove. The easiest way to go camping is when you’ve decided to fast as well. I packed a tent, a sleep mat, a sleeping back, and my backpack with water. I also had a knife and a lighter. Oh, I brought a bible too. It took about 5 minutes to set everything up, then I prayer hiked down to the falls. About halfway through the falls loop, I took a break and cracked open my “Read the Bible cover to cover” bible. I read for quite awhile about King David and the tragedy of his family. David loved God, made one huge mistake, and it caused turmoil for his kingdom and his kids. 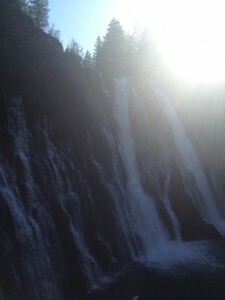 I really felt good after that time, and finished off the falls loop hiking trail. At the top of the falls again, I stopped and read a few chapters of Tommy Barnett’s book, Reaching your Dreams. After going through some of it, I felt pretty good about my current life trajectory. I am definitely doing what God has called me to do, and I really enjoy doing that. I have an idea about His plan for us 20+ years from now, and am enjoying the journey to getting there; even when it’s hard and I don’t really know what’s going on. It was early afternoon when I went back to the camp, laid on my sleeping bag, and started reading the Bible again. After some reading, and a quick cat nap, I went on a prayer firewood collecting journey. What I mean is I didn’t want to buy firewood, and I prayed as I collected branches. Once some sticks were collected for what was looking to be a puny fire, I headed down to Balm Lake to sit by the water, watch the Osprey fish, and read some more Bible. By now, I was in 1 Kings, and just seeing mistake after mistake that many of the kings made. God spoke to me through that, and I don’t ever want to do something God doesn’t want, or not do something God does want. But as I sat by the lake and read, after about an hour God just downloaded on me. After getting away, praying and spending time in God’s Word, I really hard God clearly. He spoke to some major areas of life and answered some questions that I haven’t even been asking about recently. It was a great and needed reminder that God is truly faithful. When we have maybe lost His way, He will bring us back onto a path that He wants us to walk down if we’re open and willing. Well getting into creation and alone with God was exactly what I needed. By 6pm I was refreshed, had heard what I needed to hear from God, and I missed my family. I struggled with deciding to go home early or not, and decided to stay. 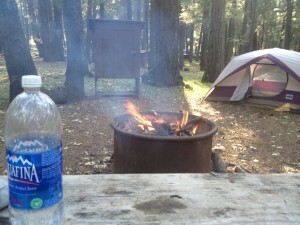 After jamming my car full of wood I found near the lake, I headed back to camp. 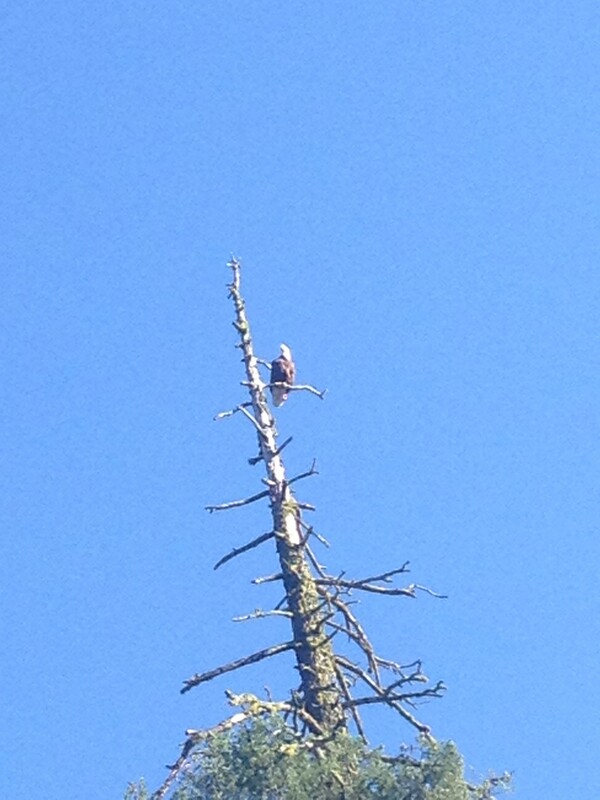 On the way, I saw a huge eagle perched on the tree. It was just a reminder of why I love being outdoors, and how much I missed having not done enough fun things the last few years. Life with little kids, and illness, and hospitals coupled with just the weariness of life let me get away from fun. I’ve taken life way too serious, and the day in Tahoe and the day at the falls really helped reset my perspective both with God, and with enjoying life more. Once back to camp, I walked back down to the falls to watch the sunset behind the mountain while reading some more Bible. It was so peaceful; there weren’t really any people around, and it was serene to just read the Bible while listening to the falls and being sprayed by the mist. It was without a doubt, the best getaway I can remember taking. My view from sitting on the bench (to the right) while reading as the sun went down put me in awe again of how great God is. I laughed as I had hiked earlier at all the posted signs that described the formation of the falls from millions of years back, as if they had any real evidence to support that. As the sun went down, I went back to camp for more Bible reading (notice a theme from the day) and prayer. I read until it got dark, and even then still a little more by firelight. Then I prayed until I saw stars in the sky, and the fire burned out. I’d found a great tree stump filled with termite larvae and guess what I did? I used the dried wood from the stump for firewood 🙂 After dark, I went and laid down, read more Road Trip Leadership in bed on my iphone, and prayed until I fell asleep. I woke up the next morning at about 3am. I’d like to say God woke me up with an amazing and powerful word, but it was because it was about 30 degrees and I was freezing. I think I eventually fell back asleep, but at about 7:30 I read the bible a little more, hopped in my car and drove home. I had big plans for the family. When I arrived home to much fanfare, I told Amanda to start packing, we were going to SoCal for Mother’s Day. We would leave the next day, drive down, spend Mother’s Day at the beach, then come back Monday. She decided we should leave immediately, stay 3 nights, and have 2 full days of fun. I had some cash from selling Madden Ultimate Team cards, so I gave her what she wanted. We left the house at about 1, hoping the kids would nap. They really didn’t. We made it a solid 6ish hours before people started going crazy, which wasn’t too bad. We took the 5 all the way down, and only had to make a stop or two. At the grapevine entrance, we let the kids run around, and made our way. We hit downtown LA around 7:30, and only had 23 miles to go to get to Anaheim. 1 Hour later, we made it. The kids normally go to sleep at 6:30; but at 8:30 when we got into our room they were hyped. Hannah was just running back and forth; apparently driving all day and sitting in a car seat didn’t burn off their normal energy. Around 11pm they finally all went to sleep, it was a little creepy having Chloe stare from Hannah and her bed across to Amanda and my bed all night. She would wake up and talk to me in the middle of the night. We woke up bright and early, the reason the kids go to sleep at 6:30 on a normal night is it doesn’t matter when they go to bed, they wake up early. Falling asleep after 11 got them to sleep all the way in to 7:10, and by that time I had 3 kids snuggling me, while we watched tv, as Amanda slept soundly. 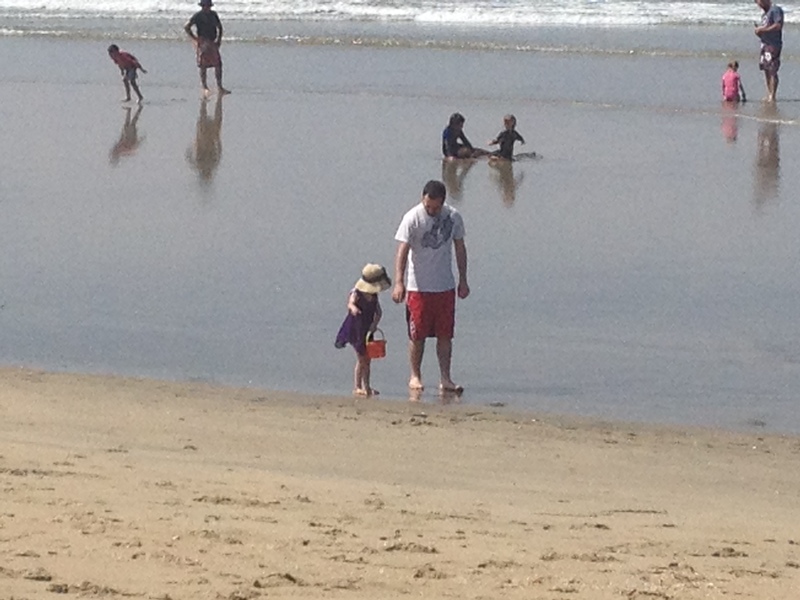 We eventually got up, ate some breakfast, got dressed, and decided on Huntington Beach. The weather was perfect, and we made it to the beach around 10am. As per usual, the girls wanted nothing to do with the scary ocean or water. The entire first hour was holding them above the water as it came in, and them clinging for their lives if we tried to set them down in it. Eventually, Chloe came with me to collect shells; we barely went into the sand that was wet. Eventually they got a little more bold, and Hannah finally started to play with me in the water. We spend a good amount of time jumping over waves together, and she had a blast.